Looking for quick and easy needlepoint fun designs and projects to make for Halloween? Check out these small versions of two traditional Halloween classics to stitch pumpkins & spiders and candy corn inserts to decorate seasonal Mason Jar tops. Both projects work up fast in the long stitch and are great for needlepoint newbies—even though the canvas mesh size is finer than most beginners are likely to use. 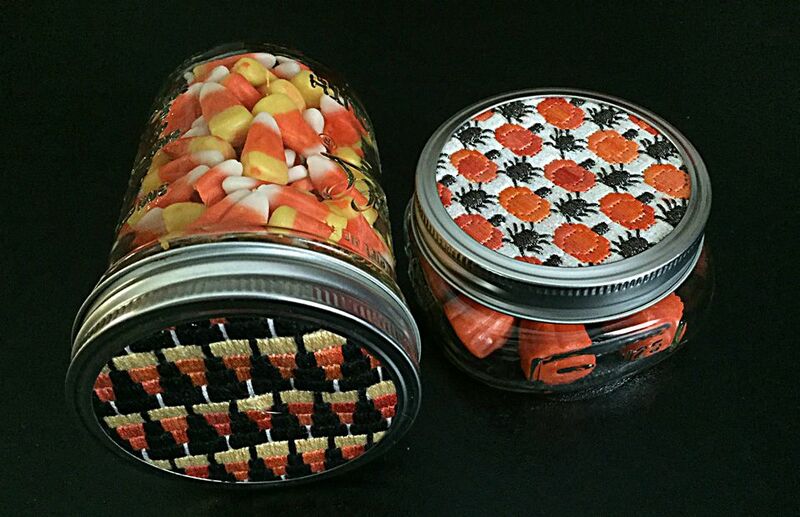 Once the needlepoint is finished and attached to the tops, you can fill the jars with your favorite Halloween candies to serve party guests or trick-or-treaters. Mason Jar tops are quite versatile with an inner flat disc and an outer ring that secures the tops to the jars. As a result, you can make several of these interchangeable needlepoint projects to use for all sizes of Mason jars, from jelly jars to decorative half-pint jars to gallon sizes as well. Put the basics as well as new decorative needlepoint stitches you’ve learned to work in making these super easy projects. Tent stitches will work well if you’re only comfortable using them; however, straight stitches worked vertically and horizontally will make the finished designs really pop! Mason Jar Tops – either regular or wide-mouth based on your preference. The inexpensive jar tops can be purchased separately or with jars. They are sold in craft, discount and department stores as well as supermarkets. Size #18-mesh Mono Needlepoint Canvas or Perforated Paper Canvas – Scrap pieces you have on hand are ideal for this project. However, you can purchase canvas by the inch from local needlepoint shops or online. Use the Mason Jar top to measure how much you will need. For regular canvas, add at least 2 inches on all sides for stitching and finishing. Multipurpose Craft Glue– Use an adhesive that will stick the finished needlepoint to the metal jar top. Household or Craft Scissors – Cut pieces of canvas with these inexpensive scissors, and use them for snipping blank canvas threads around the finished needlepoint. Embroidery Scissors – You’ll need these for snipping non-metallic threads as you work the design. Make sure they are extra sharp, as the finer the threads used, the sharper the scissors need to be. For metallic threads, use regular craft scissors. Assorted Threads – Search through your thread stash for metallic, cotton or other threads and fibers. Make sure they are washable in case you need to clean sticky spots from the finished needlepoint. Stretcher Bars – These will be required to mount the blank canvas for stitching. Use the same size bars as the canvas piece. Masking or Painter’s Tape – The easiest way to bind rough canvas edges is to use tape that does not leave a residue once the canvas is removed. You can also turn the rough edges under and sew with a zig-zag or straight stitch on a sewing machine. Rust-proof Thumb Tacks or Staples – Tacks are preferred for attaching canvas to stretcher bars; however, if using staples, try to avoid splitting the canvas threads. Regular Stitching Supplies – Most needlepointers have a kit of regular needlework supplies. To successfully work these projects, you will need a laying tool, tapestry needles, magnets, frame weight holder, daylight lamp and possibly magnification. Halloween pumpkins and creepy spiders parade across the needlepoint canvas in this easy-to-work design. The quick project can be worked on #14 or #18-mesh single thread canvas; but for a small Mason Jar lid, the finer canvas is best. Overdyed orange cotton thread with medium to dark shading is perfect for the pumpkins to make each one look different as well as to accent the finished needlepoint project as a whole. Deep brown to black should be used for the spiders, which are also worked in straight stitches. The Pumpkins & Spiders needlepoint design uses two charts. Each chart depicts more of the design than you will need to stitch the project so that you can easily work any compensating stitches. The left chart shows the orange and brown horizontal long stitches that are used to work the pumpkins and main body of the spiders. The gray colored stitches on the chart are the background fill. They can be worked in any light colored thread that will draw attention to the pumpkins and spiders. The right chart includes the backstitch lines for the spider legs. You will work the four main legs first, and then fill in the remaining legs free-hand on each side of the spider body. Trace the round shape of the jar lid on the canvas and mark the absolute center. To make sure the pumpkins and spiders are evenly spaced, locate the center of the chart in the left image by connecting the horizontal and vertical arrows. Use this as a guide to stitch from this point outward to the shape edge. Work as many complete pumpkins and spiders as possible to fit the shape, saving all compensating stitches for last. Fill in the background and then work all compensating stitches. In some cases you will be working over one canvas thread. When using straight stitches this way, it is sometimes necessary to work the stitch again over what you have just made so that it does not sink into the canvas. Use a single strand of black cotton embroidery floss to work the spider legs (see the right chart). Work the four main legs first and then fill in the rest. Get ready for stress free stitching! You can relax and enjoy your needlework experience with this fun candy cane design that’s the easier of the two Halloween needlepoint patterns to stitch. As you work, the sweet candy corn shapes will alternate with a black background as you stitch up and down as well as side to side over the canvas. You can follow the traditional candy cane colors exactly, or branch out on your own to choose threads and fibers that will make the project sparkle and create the perfect look for your Halloween decorating scheme. The simple Candy Corn Needlepoint Design can be completed in less than one hour once you have assembled all the supplies and mounted the canvas. The pattern is easy to follow when starting in the center and working outward in any direction. Work the pattern on perforated paper with single ply thread for best results. All of the stitches are worked evenly over four canvas mesh threads. Once the stitch pattern is established, it is easy to complete the needlepoint project. Follow the first 4 steps of the pumpkins and spiders project to accurately place and stitch the needlepoint design on canvas. Make sure you have enough good lighting when working the black background fill area. Without this, you may get off track when placing the stitches--even after working the candy cane motifs. Take the canvas off of the stretcher bars and trim away the excess to within ½ inch of your stitching. If you have worked the design on perforated paper, you can skip steps 1-3. Use a sewing machine to make a running stitch as close to the needlepoint as possible. Repeat the stitch, working over what you have just done. Use a tiny paint brush to place a small amount of glue on the sewing stitches. This will make the round edges stiff enough for finishing and keep the stitched needlepoint from unraveling. Be careful not to get any glue on the needlework itself. Let dry. Trim the excess canvas to the sewing stitches. Apply a thin layer of glue to the wrong side of the needlepoint as well as the center of the jar top. Center the needlepoint over the jar top and gently press in the middle and lightly smooth outward to the edges. Do not press too hard as the glue may seep through the needlework. Once you are sure that the needlepoint is smooth and even, let the jar top dry thoroughly. Fill the jar with candy or other Halloween treats. Place the jar lid on top and then screw the ring to secure the lid. Enjoy!